When will be The Victorian Slum next episode air date? Is The Victorian Slum renewed or cancelled? Where to countdown The Victorian Slum air dates? Is The Victorian Slum worth watching? A group of 21st-century people move into a Victorian tenement that has been painstakingly brought back to life in the heart of London's East End. In the heart of the modern East End of London, a Victorian slum has been recreated and a group of 21st-century people are moving in. 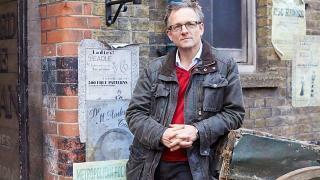 Michael Mosley joins them to tell the extraordinary story of how the Victorian East End changed our attitude to poverty forever. The slum dwellers have left behind the 1860s, when London was the richest city on earth and it was hard but possible to make ends meet. Now they must live through a dire economic depression that blighted the 1870s. Tailoring family the Howarths have become 'sweated workers', so called because of the rate at which they had to work. They must toil nonstop to make up Victorian factory orders for clothing. It is food for thought when they are forced to employ their neighbours' children to complete the work. The Potter family can no longer rely on breadwinner Graham as he struggles to find work so they join forces with single parent Shazeda to try and get by making artificial flowers. For Heather Potter, the experience has added poignancy when she finds out the fate that befell her own poverty-stricken East End ancestors. There are new arrivals in the slum when siblings John and Maria Barker arrive from Ireland. They are horrified by the conditions that would have greeted Irish migrants to Victorian London. But they are young, strong and have no dependents and they do have the ability to work. As the week progresses, rent collector Andy and the shopkeepers the Birds begin to worry that some in the slum won't be able to settle their debts. A moonlit flit has a knock-on effect for all and the harsh realities of life for the Victorian poor hit home. The slum dwellers have moved into the 1880s - a turbulent decade for London's East End. Unemployment was sky high, living conditions intolerable - but still people came, desperate for work. The pressures are immediately felt by the Howarth family, who find themselves employing new workers in their Victorian sweat shop. Their workforce would have been made up of newly arrived immigrants, and the Howarths' workers all have their own story to tell. But Mandy Howarth is moved to tears when she finds out that the sweated trades are part of her own family history. The Potter family become street sellers, selling sheep's trotters and jellied eels in London's East End. But their newfound living is quickly curtailed, as it was in 1880s Bethnal Green. Fellow slum residents Andy Gardiner and John Barker come face to face with the harsh realities of working life in London's docks during the era when only one of them could have hoped to earn. The slum dwellers have moved into the 1890s, when Britain was slowly recovering from an economic depression. In the final episode the slum dwellers move into the 20th century and social change is in the air. Community spirit is embodied by the arrival of the cooperative movement and shopkeepers the Birds have members to look after, rather than customers to profit from. While some continue to prosper, others come face to face with the poverty still endemic in British cities during the era. The effects of this on children hits home when the slum's kids see photographs of their Edwardian counterparts. But they all get a taste of the great wealth enjoyed by the privileged few when Edward VII's cancelled coronation banquet turns up at their door. The wider world continues to impact on life in the slum and some enjoy a day trip out to the countryside. The men exercise their right to vote and the women of the slum learn what East End women did in the quest for suffrage. At long last there are state-wide measures designed to alleviate the plight of the poor, and it's time for the slum dwellers to return to life in the 21st century. As they prepare to leave, thoughts turn to the effects of slum clearance on British communities and to lessons that can be learned for the future. The Victorian Slum next episode air date provides TVMaze for you. EpisoDate.com is your TV show guide to Countdown The Victorian Slum Episode Air Dates and to stay in touch with The Victorian Slum next episode Air Date and your others favorite TV Shows. Add the shows you like to a "Watchlist" and let the site take it from there.